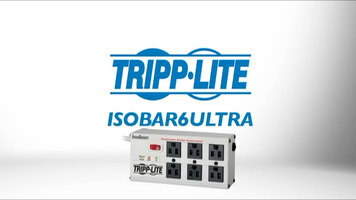 The ISOBAR6ULTRA premium surge suppressor protects computers, peripherals, electronics, appliances, and other equipment against damaging surges, spikes, and line noise. It has a UL verified search protection rating of joules. The bars a gold standard surge protection ratign of 3330 Jules. The ISOBAR is a gold standard in surgae protection with more than 18 million sold. In addition to its best in class surge blocking architecture, this ISOBAR model also includes exclusive isolated filter banks. Isolated filter banks eliminate interference between connected devices and minimize the effects of VMI and RFI noises on your equipment. With a rugged metal housing and robust internal components, the ISOBAR6ULTRA is built to keep working long after other premium surge suppressors have burnt out and left your equipment exposed. It's backed Tripp Lite's no-hassle lifetime product warranty and connected equipment insurance. So if you need the best in class protection that's built to last, order the gold standard, Tripp Lite Ultra. 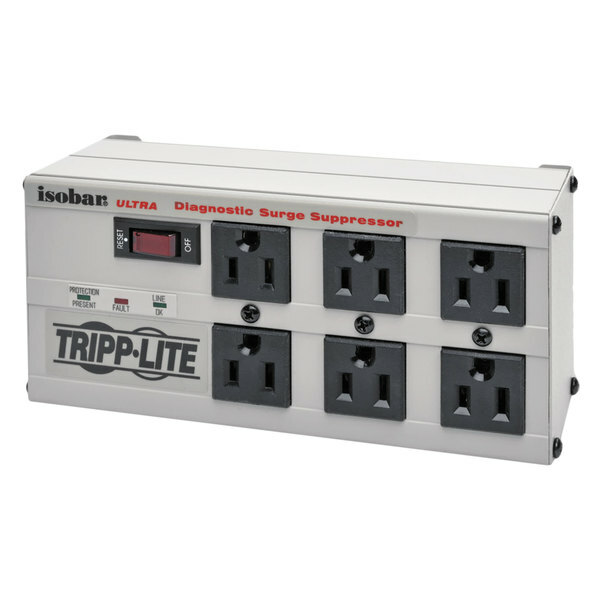 Protect your electronics with this Tripp Lite ISOBAR6ULTRA Isobar 6' light gray 6 outlet metal surge suppressor. 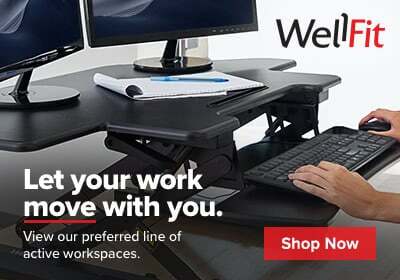 This surge protector has a 6' light gray power cord with 6 outlets for connecting a wide variety of electronic devices such as computers, printers, and TVs! Housed in a heavy-duty, impact-resistant metal case this surge protector is ideal for warehouse, kitchen, and production applications yet still aesthetic enough for office use as well. Simply plug this surge protector into a wall outlet and then plug your appliances into the surge protector to ensure they remain safe from unexpected voltage spikes. You can be sure your electronics are protected because this surge protector has a limited connected equipment guarantee of $50,000. Additionally, this surge protector allows you to quickly and easily expand the plug capacity of your outlets. Each surge protector is able to absorb up to 3330 joules of electrical energy. Included safety covers protect against dust while blocking accidental contact with unused outlets. There is a power switch and indicator light on the top of the surge protector for added convenience. The housing of surge protector is heavy duty metal and appears to be very high quality and worth the price. Haven't had any surges hit my house yet while using this product so I can't comment on its surge protecting abilities. I also like how it comes with a metal bracket allowing you to securely attach the protector to an outlet (good if you have kids or animals that are liable to pull it out of the plug accidentally).